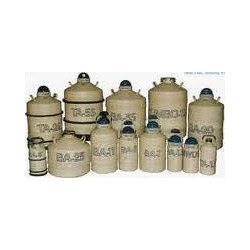 We are manufacturer and trader of Nitrogen Cryocans and liquid nitrogen cryocans.We provide an extensive range of cryocan liquid nitrogen container which successfully caters to the requirements of various industrial establishments.Supplied throughout with our wide distribution network, this liquid nitrogen has a wide variety of applications. We are a reputed and authorized dealers of IBP(IOCL) to sell Liquid Nitrogen containers and its accessories. The containers are available in various capacities and technical specifications with different capacities and as required by the user. Our product list also includes other cryo cans and dura cylinders of various brands such as INOXCVA, CHART of Liquid Oxygen, Liquid Nitrogen, Liquid Argon and any other as per client's requirement. We also supply Liquid Oxygen to hospitals in bulk containers. Looking for Nitrogen Cryocans ?